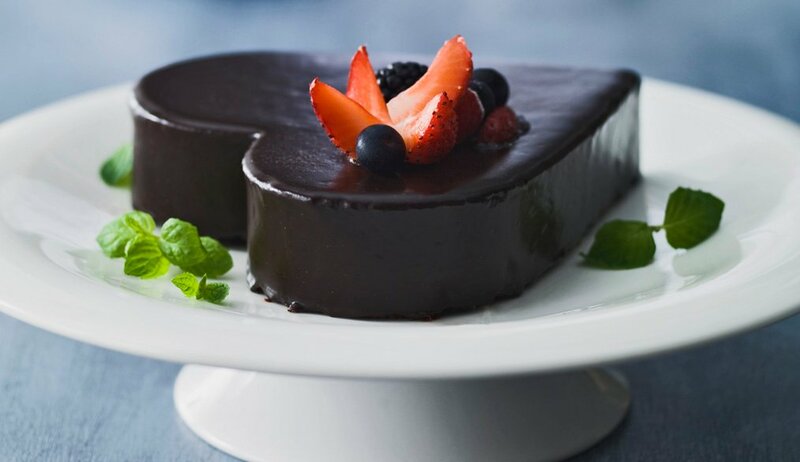 Le Cordon Bleu Chefs would like to share an original heart-shaped chocolate cake recipe with you. Taken from the Collector’s edition of the Petit Larousse du Chocolat this dessert, which is simple to make and surprising, will provide the perfect finale to your meal! Preheat the oven to 180ºC (355ºF). Butter and dust with flour a heart-shaped cake tin (or a 24 cm round cake tin). Melt the chocolate and the unsalted butter over a bain-marie; stir until smooth. Beat the egg yolks and 75 g of the sugar until they are pale and thick. In a separate bowl, whisk the egg whites, gradually adding the remaining sugar until they are smooth, shiny and stiff peaks form. Fold the sifted flour into the egg yolks-sugar mixture and combine with the melted chocolate-butter mixture. Whisk 1/3 of the egg whites into the chocolate mixture to lighten it; carefully fold in the remainder in two separate batches. Rest the batter for 5 minutes before pouring it into the prepared cake tin. Bake for 40 minutes. Cool on a rack before turning the cake out; refrigerate for 20 minutes. Coarsely chop the chocolate and place in a bowl. Heat the cream in a small saucepan until simmering and pour over the chocolate; stir until smooth. Set the ganache aside for about 10 minutes at room temperature, until it can be spread easily. When the chocolate cake is cold and fairly hard, cut a thin slice from the top to level it; use a long serrated knife and cut in a sawing motion. Spread the ganache evenly over the entire surface of the cake; refrigerate for 30 minutes until firm. Decorate with berries. Note: The cake can be kept refrigerated for 2-3 days. It can also be served with crème anglaise or whipped cream.